As all the giggly girls who attended my daughter’s 8th birthday party were leaving, Kate-the-Great-who-Just-Turned-Eight began doing what any normal lil’ diva does. And it’s a good thing we’ve got 364 days, because this momma needs to put her feet up. But truth be told, the party was actually enjoyable, for me too! With four kids, I’ve hosted my fair share of birthday parties. And usually, those 2-3 chaotic hours are almost as much work as the original day of birth; personally, I’d prefer to commemorate the blessed event face down on a massage table with only nature sounds and the scent of lavender to keep me awake. But I can’t deny my child an essential right of passage. Even so, I just can’t throw a standard soiree anymore; mounds of paper and plastic trash destined for the landfill, and fake foods filled with unnatural colors, flavors and fats. Because it doesn’t have to be that way. Our kids deserve better. So I decided to host a green birthday party that would highlight the importance of sustainable living. 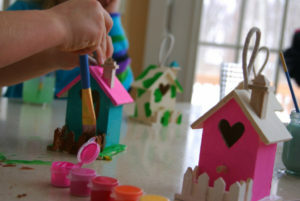 My daughter loves to make crafts, and wants her guests to take home something they will use. She has a budding eco-friendly conscious, and wanted to paint reusable shopping bags, make bird houses, and serve a vegan taco bar with gluten free cake. Can I say I’m proud? 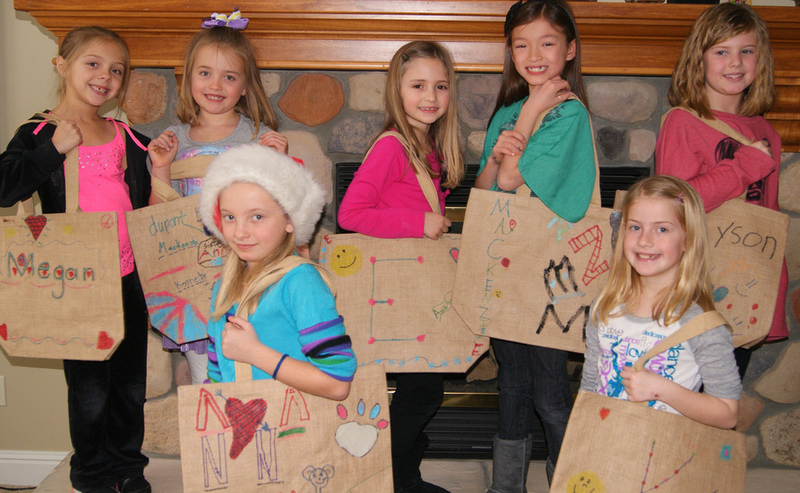 Each girl decorated her own jute bag, and then they autographed each others. 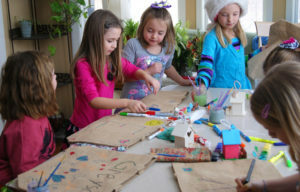 They each created a one-of-a-kind designer bag not available in stores! The girls now have their own reusable shopping bag that carries a delightful memory along with a sense of personal empowerment that they can make a difference. I challenged the girls to count how many disposable bags they don’t need to take from the store each time they take it shopping. They can keep a tally right on the bag! There are some lucky birds that will have bright, new and custom housing. Notice the camouflage decor in the back. Good thinking. I think that one’s equipped with WIFI too…. I included Michaels and the grocery store on my weekly errand run so that I could get the supplies and ingredients that I needed. Check your own art supplies before you purchase more, and make a list before you go. Combine as many errands in one trip as you can, and take reusable shopping bags! 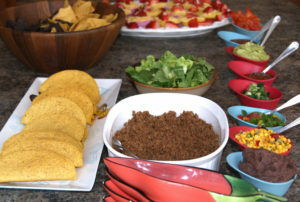 The Vegan Taco Bar was LightLife crumbles, sauteed in cumin and chili powder, with chopped organic veggies, refried black beans, homemade guacamole and corn shells. I substituted orange juice for the water in Pamela’s Gluten Free Vanilla Cake mix, and made a simple icing with powdered sugar and more orange juice. 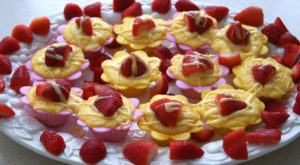 Fresh organic strawberries served as the “edible decoration”. If you’ve never played with the orange flavor, you’re missing out. It’s easy to substitute freshly squeezed organic orange juice for liquid in any vanilla recipe. Finely grate a little zest (orange rind) into the batter and prepare to be impressed with yourself. Check out my recipe for orange cookies. 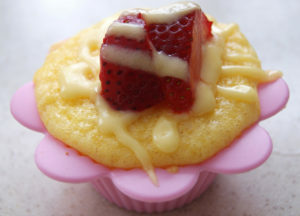 Each cake was baked in a silicon baking cup shaped like a flower. The color and shape offered a reusable accent that will be enjoyed again. This delicious orange cupcake is gluten free and vegan, made with whole and organic ingredients. It’s FAR better than anything you’d find in a plastic package at the grocery store. 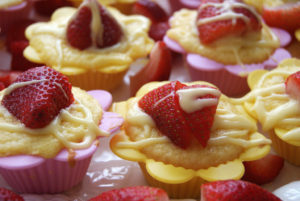 Hosting a green birthday party is less expensive, simple to plan and far more rewarding than the typical alternative. Showing our children that their future is not disposable is the best gift we can give.